The Eurovision Song Contest 1964 was the ninth Eurovision Song Contest. It was held in Copenhagen, the capital of Denmark after the Danish victory the previous year. Italy won the contest for their first time scoring 49 points with the song Non ho l'età, performed by Gigliola Cinquetti and written by Nicola Salerno and Mario Panzeri. The venue choice for the contest was Denmark's famous amusement park and pleasure garden Tivoli Gardens. The park opened on August 15, 1843 and is the second oldest amusement park in the world, after Dyrehavsbakken in nearby Klampenborg. The amusement park was first called Tivoli & Vauxhall; Tivoli alluding to the Jardin de Tivoli in Paris, and Vauxhall alluding to the Vauxhall Gardens in London. A political protest occurred after the Swiss entry: a man trespassed onto the stage holding a banner that read Boycott Franco & Salazar. Whilst this was going on, television viewers were shown a shot of the scoreboard; once the man was removed the contest went on. As with the 1956 contest, no video recording of the actual contest performance is known to survive (although one does of the shorter winning reprise); however like the 1956 contest an audio recording does exist. Reports say that this is because there was a fire at the studios of DR, the Danish broadcaster, in the 1970s. No other broadcaster recorded the entire show (although segments of the contest do exist in the archives of NDR Germany) other than for the Winners' reprise. Sweden did not participate because of a boycott by singers. They did however broadcast it. Portugal made its début in the contest, however they became the first country to score nul points on their début. Germany, Switzerland, and Yugoslavia also scored nul points for the first time. The Netherlands became the first country to send a singer of non-European ancestry, Anneke Grönloh was of Indonesian descent. 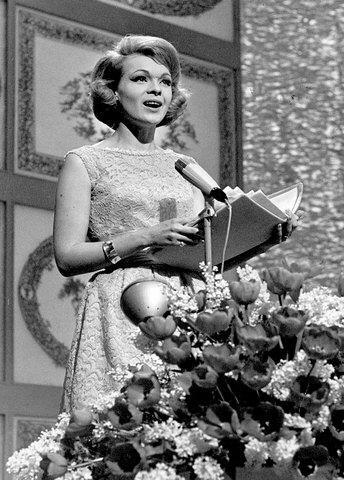 Only one artist returned to the contest this year, with Anita Traversi representing Switzerland again, after previously participation in 1960. The German song, Man gewöhnt sich so schnell an das Schöne. is the song with the longest title in Eurovision history, with 34 letters, two more than the second longest, Warum es hunderttausend Sterne gibt, the Austrian entry to the Eurovision Song Contest 1967.